The overspeed variation works on changing speeds. Players can line up in opposite corners and go two at a time. The players need to have quick feet as do cross overs around the top of the circle then bottom of the other circle. 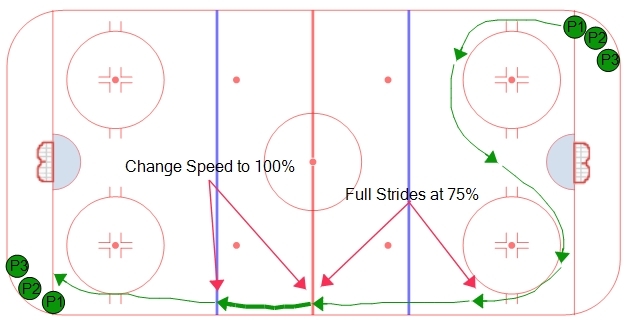 Then they skate in a straight line down the ice at 75% focusing on good, hard, full strides. Between the red line and blue line they increase their foot speed to 100%, then back down to 75%. warm up, focus on crossovers and long strides.